48º stair angle allows the user to face outwards for a safer, more natural descent. Fitted with lever operated retractable castors and a safety bar that prevents access when in the mobile position. 6 step and above require self-assembly. NB: When specifying the correct size, the optimum operator working height is 1.5m above the platform height. Extra wide expanded mesh treads - 750mm wide x 180mm deep. Platform W x D: 800 x 400mm (460mm depth, 10 tread and above). Finish - epoxy powder coated blue. 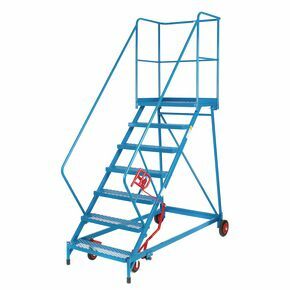 Manoeuvrable and safe steps are essential for a workplace where an employee is working at height performing tasks such as maintenance. Our reduced gradient, wide tread mobile steps offer stability and safety to the user allowing them concentrate on their tasks. Fitted with lever operated retractable castors making them easy to move from one area to another and they have a safety bar that deters access to steps when in the mobile position. The platform is 800mm wide and 460mm deep providing an excellent place for the user to stand and the extra wide expanded mesh treads makes ascending and descending the chair safer. A 48 degree climbing angle is similar to a regular staircase; this allows the user to face outwards for a safer and more comfortable descent. They are finished in an epoxy powder coated blue and have reinforced handrails. These steps are available in ten platform heights; 690mm, 920mm, 1150mm, 1380mm, 1610mm, 1840mm, 2070mm, 2300mm, 2530mm or 1760mm. 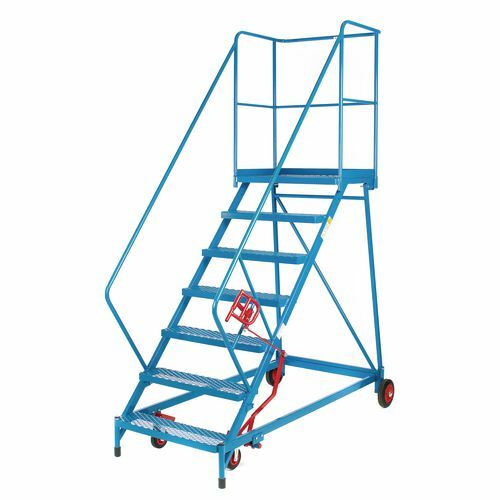 Our reduced gradient, wide tread mobile steps offer safety and stability while working at height. They come with a 12 month guarantee and FREE UK Delivery.